What was the first Christmas album you ever had? The first Christmas album that entered our home was "Christmas Is For The Family" by Dennis Day, with intro by Jack Benny. 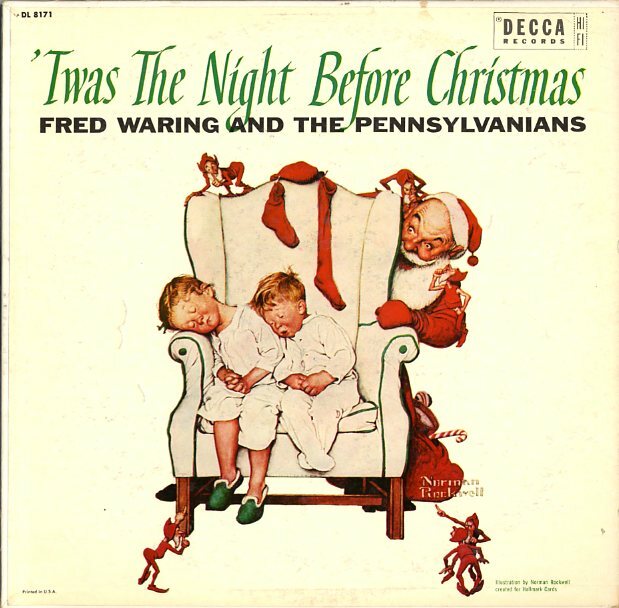 Couldn't find this one on Chip's list, but that's OK. Not very high on my personal list of favorite Christmas albums either, but it holds a certain place in my heart because it was the first Christmas LP we had in our home. This was in 1958. I presume my mother bought it. I still have our family's first Christmas "album" in my shrinking collection. Like your album, it was back in the 50s when my my dad bought us one of those little portable suitcase style record players for Christmas. Along with it he bought a couple of 45 RPM EP albums, one of which was Bing Crosby's "Merry Christmas." Discogs shows the release date as 1953, but we moved from that house in October of 1953, and I could swear that we had that album for Christmas at that house in 1952. So I guess my memory is getting things mixed up. And, as Chip's focus is on LPs, I suppose that when you asked about "albums" you had LPs in mind. But I couldn't resisit posting about this "album" because it holds a special place in my memories of my boyhood Christmases. The Dennis Day Christmas LP that you alluded to, Christmas Is For The Family, resides in the "Bubbling Under" section of my Top 500, coming in at #420. 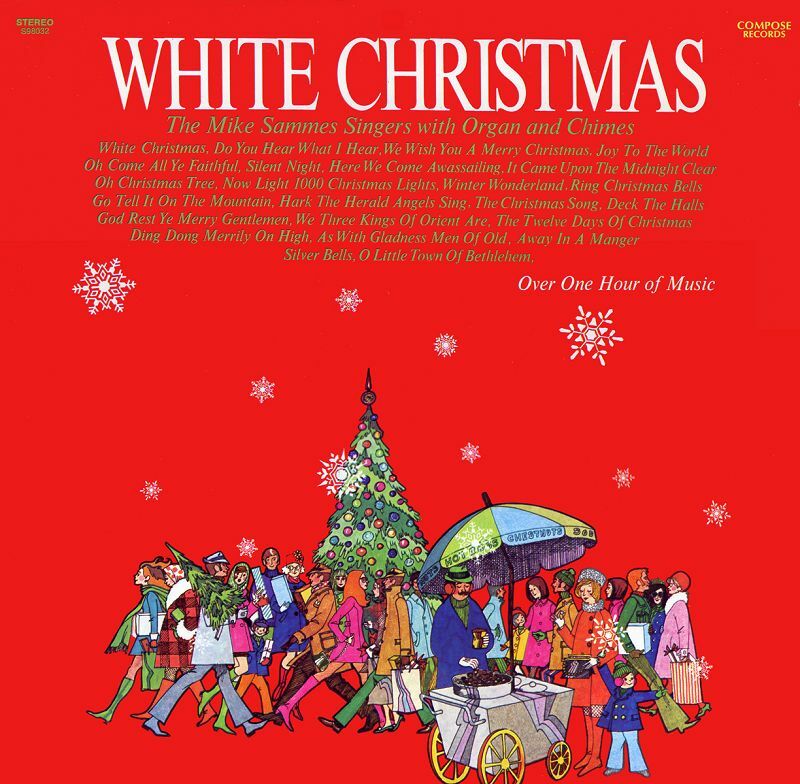 By the way, the LP was later reissued by Design Records in an abridged form under the new title of White Christmas. Discogs is wrong: that EP 45-rpm 2-record set (Decca Records catalog #ED-547) was indeed released in 1952, not 1953. So your memory's not as bad as you thought. Posted below is the complete history of Bing's Merry Christmas album on vinyl, which I had originally posted on the message board in another thread back in November of 2016. Yes, I did have LPs in mind! We also had a few 45 EPs before we got that first suitcase portable hi-fi for Christmas 1957. 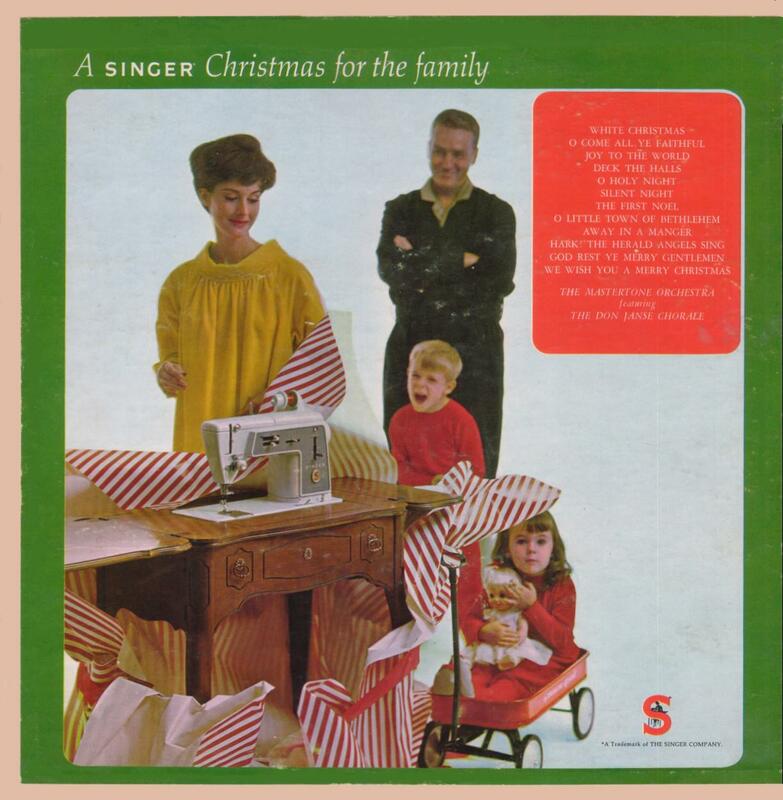 The most notable of those EPs was one of the three volumes of Percy Faith's iconic "Music Of Christmas". I never had the full length album in mono or stereo until it was issued on CD. Now I actually own three versions of "Music Of Christmas", the original CD reissue from around 1988, the double CD reissue of the original 1954 mono version of "Music Of Christmas" with "Hallelujah" (aka Music Of Christmas, Vol. 2, which I had on a Columbia budget reissue in the late 70s), and last year's remastered edition with bonus tracks. I know I speak for Chip and so many other posters on this board when I say that "Music Of Christmas" is the most iconic and beautiful Christmas album ever made. Just having that EP and hearing the tracks on the radio every year was a very important part of Christmas for me. So much wonderful Christmas music was made from the 1940s through the very early 70s that will never be surpassed by anything being made today. The first Christmas albums we ever had in our house and the only two I grew up with as a child were John Klein's A Christmas Sound Spectacualr and Johnny Mathis's Merry Christmas album with the uncomparable Percy Faith arrangements. It was my thrill and honor to write the liner notes for the John Klein CD twofer that Real Gone Music got remastered and released this year. I cannot thank our fearless leader, Chip, enough for making this whole thing happen. I should say also that Elvis's first Christmas album was quickly added to the family rotation as well. Now, once I became a young adult, I started collecting on my own and now the number of Chrsitmas albums that I own exceed 300. I credit (blame) Mr. Arcuri and this fantastic music forum that he created for getting me totally hooked on the unmatched Christmas music from the Golden Age. It is a passion and hobby that I love and never tire of partaking in year around. It's still my favorite Christmas album of all time. There really are no other albums out there that sound quite like this. There' some Now Sound cheesiness in some of the vocal arrangements, but the bass/drums/organ/chimes combo has some serious jazz chops and lays down some great instrumental breaks. It's been released on CD in Australia, but with some of the medleys chopped into separate tracks with fade outs. I would love to see this come out digitally with a proper remaster. Thanks, Chip, for confirming my recollection of Christmas 1952 (and dispelling my worry that my memory was failing on me and getting the years all mixed up). And thanks, log_fan, for starting this great topic! 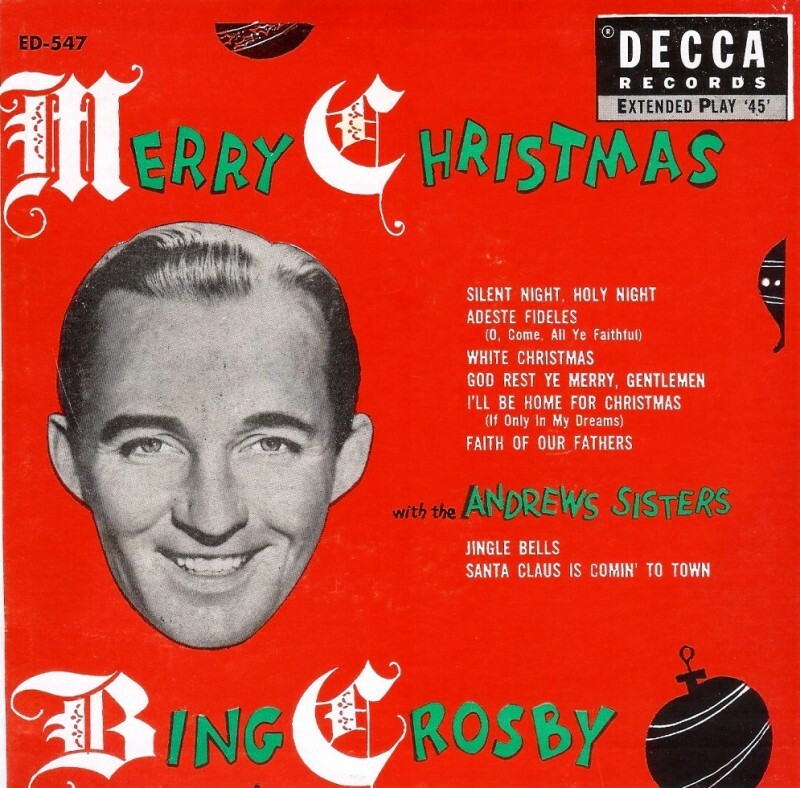 Speaking of that iconic Merry Christmas cover image of Der Bingle in that Christmas hat and holly bowtie... I don't know how many of you know this already, but that artwork actually originates from a print advertisement for Chesterfield cigarettes, in which Bing appears alongside a similarly-attired Arthur Godfrey, Perry Como, and Bob Hope. You can see it here. Oh, and the first Christmas album my family owned that I can remember really paying attention to was Ray Conniff's We Wish You a Merry Christmas. I can remember playing their version of "The Twelve Days of Christmas" over and over again. It was either "Christmas With Conniff" or "Perry Como Sings Merry Christmas Music" -- it was was back around 1965 or 1966 when I was 5 years old or so !! I started out with a whole bunch! Although she doesn't remember, I swear my mom must have joined the Columbia House club at some point, as we had a lot of records in general from the Vista Marketing home office in Terra Haute: as far as the topic, this included Disney Merry Christmas Songs, Disney's A Christmas Carol (which of course would become the basis for Mickey's Christmas Carol), and A Country Style Christmas. The Mastertone Orchestra featuring the Don Janse Chorale. 1949: Re-released as a 10" LP with blue cover and picture of Bing with a total of 8 songs (Decca catalog #DL-5019). rsteven, I have to admit I had never heard of John Klein or this album until your post. I'm giving it a listen on YT while I'm typing this. The title of the album says it all, "Christmas Sound Spectacular". So does the caption in the upper right hand corner of the cover, "1500 Bells In Stereo". I like what I'm hearing. Thanks for posting this! 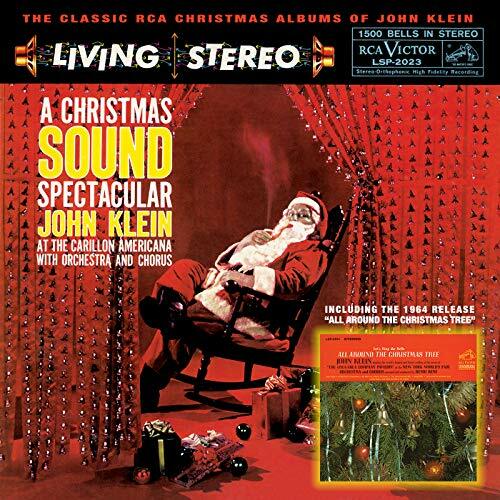 Log_fan, it was my pleasure to spread the word about John Klein's very iconic album, A Christmas Sound Spectacular, on RCA Victor's Living Stereo imprint label from 1959. And let me tell you, if you love what you have heard on YouTube, wait until you hear the fantastic remastering that Mr. Mike Piacentini did with the first generation master tapes at Battery Studios in New York on the Real Gone twofer CD release. This album was so hyped by RCA Victor at the time that they did an unprecedented "money-back" guarantee banner for the vinly album, so you could return it if you did not think it was "the finest sound you had heard on record". I grew up listening to this album as my father brought it home from his radio station that he was the Program Director for back in the late 1950's and early 1960's, the Mighty 690 in San Diego. Without Chip's direct involvement, this amazing release never would have come to fruition. I think we can safely say that about so many other iconic albums that RGM has released in the last few years, including Percy Faith's Music Of Christmas Expanded Edition, with the stupendous remastering from Elvis Presley restoration engineer, Vic Anesini. I highly recommend both of these fantastic instrumental albums for any serious collector of holiday albums from the Golden Age of Christmas, along with Mantovani's Christmas Carols album as well. As a kid in the 50's, we had 45 records and I remember "I'm getting nothing for Christmas" by Barry Gordon and "I saw mommy kissing Santa Claus" by Jimmy Boyd. I don't have either one of those records anymore! I remember Jesse Crawford plays Organ and Chimes for Christmas as my first album as an adult. rsteven (Steve), the YT version of A Christmas Sound Spectacular was definitely uploaded from vinyl, as I could notice the ticks and pops. I'm sure the remastered CD is fantastic. Nice to discover stuff from the Golden Age of Christmas that I never knew existed! This year, I added the three Ray Conniff Christmas albums to my CD collection. I certainly was familiar with Ray Conniff's Christmas music, since many of the tracks were radio staples for many years. The only Ray Conniff Christmas album I ever owned was "The Ray Conniff Christmas Album", originally titled "Here We Come A-Caroling", released in 1965. It was Ray Conniff's last Chrismas album. I purchased it around 1974 on Columbia's budget label. Ray Conniff's Christmas albums are a cornerstone of the Golden Age of Christmas. Wow, your dad was PD of "Mighty 690" in San Diego! I guess that was during their top 40 heyday. Very powerful station! IINM, that station was a border blaster, studios in the US, transmitter in Mexico where they could pump out 100kW on AM. Those were the days! 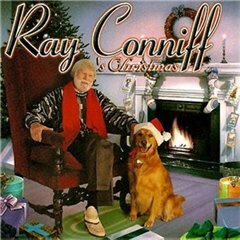 That is not correct: Ray Conniff's last Christmas album was 'S Christmas from 1999 (Brazil). It resides in the "Bubbling Under" section of my Top 500, coming in at #373. Thank you for that info, Chip! Happy New Year to you! Sure thing, Frank. And a Happy New Year to you too, and to all of you folks on the board. Yes indeed log_fan, the Mighty 690 was indeed a top 40 "border blaster", and it was broadcast at 50,000 watts "all clear", which made it one of the most powerful signals in the country. We went directional at night so we would not interfere with the stations that came on in the evening. My father was actually a co-owner and founder of the station, along with his brother and sister, who also helped to finance the Disneyland Hotel in Anaheim, California, when Walt Disney was running short of money. I have a picture of my Aunt cutting the ribbon at the opening of the hotel. I do highly recommend you get the Real Gone CD version of A Chrisrtmas Sound Spectacular as the remastering does indeed beat the heck out of the sound you here on that scratchy vinyl version on YouTube. I also talk about my father and the Mighty 690 briefly in the 6 page essay of the liner notes for the Real Gone twofer CD version of the album as well. Again, I cannot thank everybody enough for their support on this CD release as we are getting some fantastic five star reviews on Amazon. Real Gone Music had to order additional copies from Sony Music based on strong pre-orders for this release back in November. Again, I cannot thank Chip enough as well for without his knowledge, expertise and postition as Real Gone Music's primary holiday music consultant, this project never would have even gotten off the ground! It was truly a pleasure, Steve. The greatest gift of all is the gift of music. And I'm very proud of my role in getting this release out. As I told you before, I think my packaging it as a 2-fer CD with Klein's follow-up album from 1964 is what finally sold the deal with Gordon. In addition, because this is such a unique Christmas album, and you are such an ardent fan of it, I knew that my choosing you to write the liner notes was a must -- and you didn't let me down. They were superb. I'm so glad that both of these albums are now back in print. First album was either Herb Alpert or Percy Faith "Music of Christmas " . And yes it was exciting wnen I put two and two together and realized I had those same songs that I was hearing on the Yule Log. Love the Bert Kaempfert album and while Bert is not the king of Christmas music he's most definitely the king of easy listening. I also think the Hollyridge Strings album is absolutely phenomenal . Thanks for the great compliment on the liner notes for the John Klein A Christmas Sound Spectacular release. It was a life long dream to get this album remastered and back out to the public, and I never thought in my wildest imaginiation that I would end up so intimately inolved in the project, but thanks to you it happened that way. Wow, I think your decision to make sure we issued the project as a twofer CD was so wise as I know several people that just love that second album as much or more than the first one of Mr. Klein's. While the first album got so much hype and publicity at the time with its almost "1500 bronze caste bells" and its stellar Billy May inspired orchestral arrangements, the second album has a unique and silky feel all its own with the great Henry René arrangements. Mr. René of course was well known for the great orchestral arrangement on Eartha Kitt's iconic "Santa Baby" single. It also would have been a shame to not get his second album remastered and released on the twofer CD, because if we had not done it with this fine release this year, I doubt it ever would have happened on its own in the future. Besides, with both albums on one CD, you get over one hour of great orchestral instrumental music that is also accompanied by the glorious bells of the world's largest and most beautiful sounding carillons. Percy Faith is not only the King of Christmas Music, but by virtue of the number of albums he released (82) and the number of #1 hit songs on the Billboard charts (3), the King of Easy Listening Music would also have to be Mr. Faith as well. In fact, his legendary international mega-smash hit song, "Theme From A Summer Place," not only hit #1 on the Billboard charts and became the top-selling single for all of 1960, but it stayed at #1 for an incredible 9 weeks -- the longest all-time run of any instrumental song in the history of the Billboard charts -- a record, by the way, that still stands to this very day. The song also won the Grammy Award for Record of the Year for 1960. While what you say is true in Billboard numbers , I find Percy Faith albums lack the consistency and quality of Bert Kaempfert 's output. And don't forget all those songs written by Bert and his partner Herbert Rehbein that became huge hits for others including Strangers in the Night and Danke Schoen. But this is a discussion for another place. There was definitely a change that came later in the consistency and quality of Percy's output. But there was a reason for it. He was at the top of his game artistically when he was based here in New York and recording at the legendary 30th Street Studios (also known as "The Church" because it was originally a Presbyterian church from 1875 until 1948). The beginning of the change came when, at the request of Columbia Records, he relocated his recording operations to Los Angeles. He worked with so many recording artists, as an arranger and music director, that Columbia felt he belonged in L.A. But what happened is that they eventually interfered with his creativity and autonomy as a recording artist by forcing him to release albums with vocals (a small chorus) to make them appealing to a wider audience. The deal that Columbia laid down was that for every 3 albums Percy made their way, he could make 1 album his way. That's exactly why his third Christmas album from 1966 isn't anywhere near in the same league as his first two Christmas albums from the 1950s. But aside from the vocals, another reason for the decline in the quality of his sound was leaving "The Church" behind, as nothing was ever like the acoustics that he had achieved with the spectacular and legendary 30th Street Studios here in New York. So yes, Bert's work was definitely more consistent from beginning to end. And it was a tragedy that he was never part of the Yule Log broadcast, which is exactly why I included 3 of his Christmas songs (all written by Bert) in the new 4th Hour that I created and produced for WPIX-TV in 2009: "Holiday For Bells," "Children's Christmas Dream" and "Jingo Jango" (click here). And yes , thank you for adding those BK songs . Good insight as well on the meddling of Columbia with PF. For BK , unless I'm missing one of his albums , all or most were recorded at Rahlstedt Studios in Hamburg. Yes, I think that's correct, Jerry. Depending on which 60s countdown you listen to, "Theme From 'A Summer Place'" often comes in as the #1 single for the decade of the 1960s. That record was nearly as likely to be found in mom and dad's record collection as it would be in any teenager's. Even more amazing the record was recorded in 1959, before the decade of the 60s even started! Steve (rsteven), when I'm not listening to Christmas music, I'm a big fan of 50s and 60s top 40 radio and music. Mighty 690 was a very influential station in its time, despite the fact it had a short fun. Didn't it flip to all-news in 1961? Thank you for unearthing "A Christmas Sound Spectacular". I'll be adding it to my Christmas collection. It's so much fun discovering music that was around in the 50s and 60s that I never heard in the day and that album sure does qualify as a hidden treasure! It was such a thrill and priviledge to get to work with Chip and Gordon Anderson, President of Real Gone Music, on this historical release by John Klein. It is also an absolute thrill when I hear about someone like you who is touched by hearing A Christmas Sound Spectacular for the first time. Thank you for spreading the word on this great forum as this is really the only way these great gems get discovered. Yes indeed, the Mighty 690 was indeed quite an important radio station in Southern California for many years. I believe my family bought in in 1957 and then they took it Top 40 in 1958, until they sold the station in 1961 to pursue other radio station as well as televison station interests in San Diego and elsewhere. The call letters were XEAK for the Mighty 690 and my father and uncle actually came up with the "Mighty 690" name for the station. My Dad found it rather pleasing, when after many years, they went back to that name that he and my uncle first came up with together. Ironically, the last televison station we owned and operated in San Diego was KTTY Channel 69. No, we did not choose that number as that was determined by the FCC when you apply for the license. Needless to say that number has been very lucky for my family over the years! The sign off by the new owner of XEAK was pretty extraordinary as the station switched dramtically from the top 40 format to all news in May of 1961. The DJ anounced an upcoming Ricky Nelson song and then the station begin playing for the next 72 straight hours and non-stop the same moronic song, "Mope-Itty Mope," by the Bosstones". It created quite the publicity stunt as every kid in high school would listen to the station and wonder to himself what the heck was going on with this crazy song being played non-stop. They may have been inspired by my father himself, who played Happy Birthday, Baby by the Tune Weavers repeatedly and non stop one Christmas morning when it was still a Top 40 station. I too am a huge fan of 1950's and 1960's top 40 music. I guess it's in the blood or something. That's correct, Frank: Percy Faith actually recorded his hit single "Theme From A Summer Place" in 1959. The exact recording date was Friday, September 11, 1959, and it was released by Columbia Records later that same month. Then, with the help of the premiere of the Warner Bros. motion picture here in New York on October 22, 1959, and more importantly, the subsequent nationwide release of the film on November 18, 1959, the song took off and landed on the Billboard Hot 100 chart in mid-January 1960. It was finally on Washington's Birthday, February 22, 1960, that it hit #1, and then subsequently stayed there for the next 9 weeks. I have always been amazed how strongly I have been drawn to the great Percy Faith and his unique skills a one of kind arranger. You say it so well, Chip, something to the effect that it sounds like his music has been piped down from the heavens or is devinely inspired. No orchestral music, but especially instrumental Christmas music, has had quite the profound effect on me that Percy Faith's Chrisrtmas music has had since I first listened to his stellar arranging work on Johnny Mathis's Merry Christmas album. Also interestingly enough, my two favorite non-holiday instrumentals are Percy's Theme From A Summer Place and Paul Mauriat's Love Is Blue. The thing that really caught my attention in your most recent post is the date that Percy Faith's Theme From A Summer Place first went number one on the Billboard Hot 100 chart. The date is February 22, 1960, which I am very proud and pleased to say is the day I was born. I guess my love for Percy's music was written in the stars so to speak! That's a nice coincidence, Steve. You have a connection to both Percy Faith and of course President Washington! One of the many things that made Percy Faith so legendary as a Christmas music artist is that his Christmas music had an ethereal, celestial, and angelic quality to it. So much so, in fact (or fancy), that it sounds like it was literally piped down from heaven. There was an otherworldly quality to it that no other recording artist has ever come close to in duplicating–and I can categorically guarantee you that no one ever will. To be able to evoke such emotion with his music is what sets Percy Faith apart from anybody else and puts him in a class all by himself. Another one of the many aspects of Mr. Faith's immense and incredible talent were his brilliant arrangements. In particular, his gift of being so deftly able to create beautiful counter-melodies that would complement the original (main) melody of a song. This is exactly why when it comes to Christmas music, he reigns supreme as the undisputed King. Chip, "Theme From A Summer Place" was a #1 hit in New York before it reached #1 on Billboard. It reached #1 in New York on February 8, 1960 on WMGM (1050 AM) and remained there for 10 weeks through the week of April 11, when "Greenfields" by The Brothers Four reached the top spot. The one thing both records had in common was they were both on Columbia Records. Thanks to this board, I'm always discovering Christmas treasures from my growing up years (the 50s and 60s) I never knew existed. YT and even Holiday Traditions on SiriusXM have done likewise. Quite the swan song for Mighty 690, "Mope-Itty Mope" by The Bosstones. A Philly doo wop tune. Quite popular in New York also. Most of the music of that era came from Philly and NYC. Of course, San Diego gave us a classic slow dance love song, "Angel Baby" by Rosie & The Originals. I bought that 45 when I was in the 3rd grade! Always loved that song! I think it reached #1 on Mighty 690 in December 1960. "Angel Baby" did quite well in New York also, reaching #2 on WABC and #4 on WMGM in January 1961. Happy New Year to you, Steve! It's only fitting, Frank, that "Theme From A Summer Place" hit #1 here in New York first, since it was recorded here! I am getting a real kick out of the latest Billboard album and single chart postions of some of the iconic Christmas music from the Golden Age. Right now, next week's Billboard Top 200 chart will show Michael Bublé's Christmas album at #3, Nat King Cole's The Christmas Song album at #7 and Mariah Carey's Merry Christmas album at #8. Now, this is the Top 200 all genre chart and not the holiday album chart. Bublé's album is from 2011, Carey's is from 1994 and Nat's is from 1963. Nat King Cole's last album to reach the top ten of the Billboard chart was Ramblin' Rose, which was released in 1965. That is a 53 year span between top ten albums. There is not a single "new" Christmas album from this year on the current Billboard 200 top ten chart for next week. It seems like people are becoming more and more connected to the great Christmas music from the Golden Age, and even Michel Bublé's hoilday album is a total throw back album to the Golden Age and was recorded at the famed Capitol Tower in Hollywood in 2011, with some of the same musicians that played on Frank Sinatra's iconic albums. Now, the Hot 100 singles chart is record setting as well as it has four holiday songs in the top ten for the first time in its history. Mariah Carey's All I Want For Chrisrtmas Is You becomes the highest ranking holiday single on that chart since The Chipmunks' Christmas Don't Be Late went #1 in 1958. Jingle Bell Rock by Bobby Helm is at #8 and Brenda Lee's Rockin' Around The Christmas Tree is at #9. Mr. Burl Ives' A Holly Jolly Christmas is at #10. On last weeks Billboard Hot 100, the great Andy Williams was at #10 with his holiday chesnut, It's The Most Wonderful Time Of The Year. These are all the highest peaks on the Hot 100 for eveyone of these iconic holiday singles. When did they start calling it "Christmas Don't Be Late"? 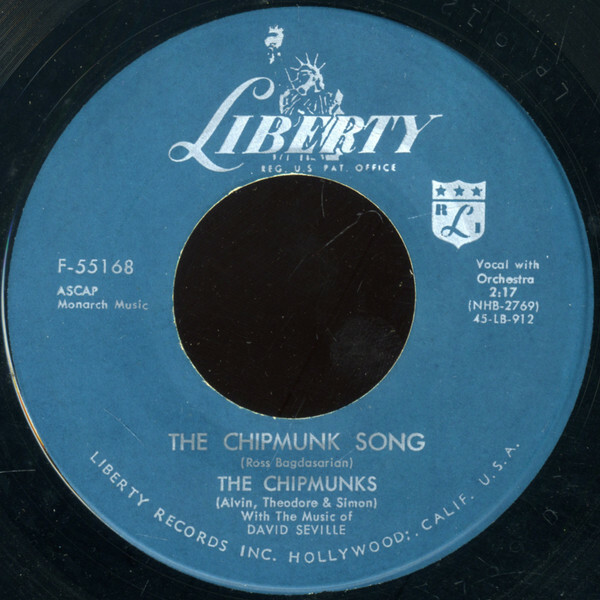 The label on my old 45 has it as "The Chipmunk Song." 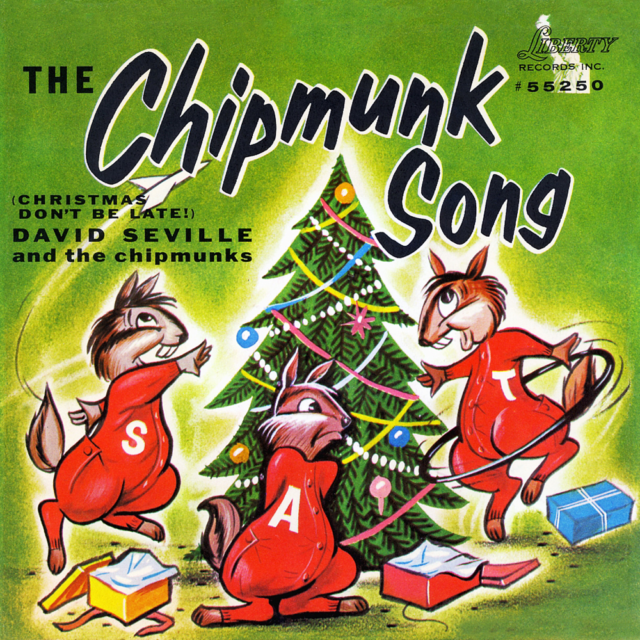 The complete official title of the song is "The Chipmunk Song (Christmas Don't be Late!)." Some releases showed the full title (see above picture sleeve), while others did not.